More than ninety years after his death, Jacob Riis maintains a stubbornly persistent hold on the American imagination. Remembered as a pioneering photographer, he was the first to document the state of New York’s slums, publicizing in haunting photographs the plight of the urban poor at the height of European immigration to the city. But Riis confessed to being “no good at all as a photographer” and in recent years has been disparaged for racist views and political opportunism. In Rediscovering Jacob Riis Bonnie Yochelson and Daniel Czitrom address the complex legacy of the pioneering social reformer. In a work of highly original scholarship, they reclaim Riis from the art camp, relocating him in the field of social and cultural history. Their provocative new book reveals Riis to be an inspired self-promoter who, although neither an original thinker nor a serious photographer, nevertheless framed the discussion of urban poverty in terms still relevant today. 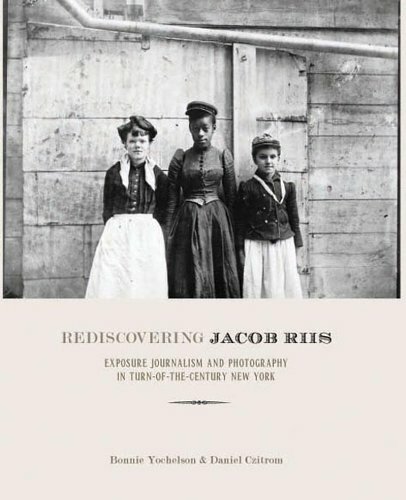 Extensively illustrated with Riis’s images, Rediscovering Jacob Riis is revisionist history at its best, as appealing to photographers, journalists, and social historians as it is to the general reader. Bonnie Yochelson, formerly curator of prints and photographs at the Museum of the City of New York, teaches at the School of Visual Arts, New York. The author of Berenice Abbott: Changing New York (The New Press), she lives in New York City. Daniel Czitrom is a professor of history at Mount Holyoke College. He is the author of Media and the American Mind and co-autor of Out of Many. He lives in South Hadley, Massachusetts.